The week of the traveling dress! So, you know that cover? The one with the stars, and the red hair, and the green dress? Yeah, THAT dress? Well, that cover was created via an actual live photo shoot. And the gorgeous girl in that photoshoot was wearing a dress custom-made for the cover. So you know what that means, right? That dress exists. It’s a real thing. I can vouch for this fact—I have held it! I have stroked it lovingly. I can testify to its insane volume and length. So, if you’re on Tumblr too, look me up! I’m hoping to do some brand new contests over there as soon as I’ve gotten settled. 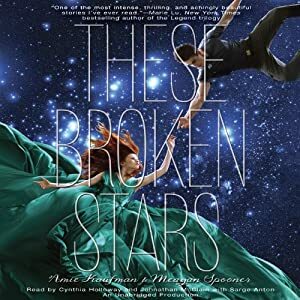 THESE BROKEN STARS Pre-Order Campaign! Ever since we revealed the cover of THESE BROKEN STARS back in February, you guys have been telling us how much you covet it. (Don’t worry, we do too. We are super grateful to our cover designer, Whitney Manger, and our photographer, Tom Corbett!) Well, we’ve been passing along your praise and wishes to our publisher, and because they’re awesome, they listened! Introducing: the THESE BROKEN STARS poster! Ask a Question (#7): What’s in store for the sequel to THESE BROKEN STARS? It’s been a long time since I did an “Ask a Question,” but Amie and I have been getting this question a LOT, so I wanted to put an answer front and center! That’s extremely perceptive of you! We actually wrote THESE BROKEN STARS to be a standalone novel. The Starbound series is not a traditional trilogy, following the same characters in one linear plot. Each of the three books will focus on a new pair of characters, and their individual stories. We love trilogies, of course, but we also love being able to read a book and have it be finished and completely satisfying in one shot, too. So with the Starbound series, we’ve aimed for the best of both worlds! favorite online or local bookseller. Snag your copy now! Do you have a question you’d like me to answer about books, publishing, or anything else? Ask it here, and enter my monthly drawing to win a prize pack of signed swag! To see more questions I’ve answered, click here.